Making a first class espresso by itself or as a base to other coffees requires some serious dedication and skill. The coffee beans should be freshly ground. The water and ground coffee require perfect ratio measurements. Plus, the water needs to be at just the right temperature and pushed through coffee at the precise pressure (around nine times the atmospheric pressure). Luckily, you do not need to bother with learning the tools of the barista trade if you have your very own coffee pod machine. These appliances have gained quite a following because they are fast, simple to use and produce consistent drinks time after time. In this guide we’ll dissect everything you need to know about these modern marvels and compare, what we believe, are the best 6 coffee pod machines available in the UK. For ease we use the terms ‘coffee pod’ and ‘coffee capsule’ interchangeably in this guide. Even though they are different in their packaging style they both perform a very similar function. You can find out the exact differences here. The Bosch Tassimo Vivy 2 TAS1402GB capsule coffee maker may not be as cute as the Nescafe Dolce Gusto Jovia, but it has its own cool striking design and comes with a low price tag that will definitely be attractive to anyone shopping on a budget. And, that’s not even the best part of this appliance. Dubbed as ‘big on taste, small on space’, the Tassimo Vivy is designed to squeeze out every last bit of taste from Tassimo (T)-Discs using intelligent INTELLIBREW technology. Therefore, if you are big on coffee, this is one coffee maker you will be sure to love having around. Read our full buying guide below to find out if this Vivy’s quick, strong, and tasty caffeine hit will be able to satisfy your coffee cravings. The great thing about the Bosch Tassimo Vivy 2 is that there are no controls to learn (or lever to pull for that matter). Just one button to push for all your drinks! 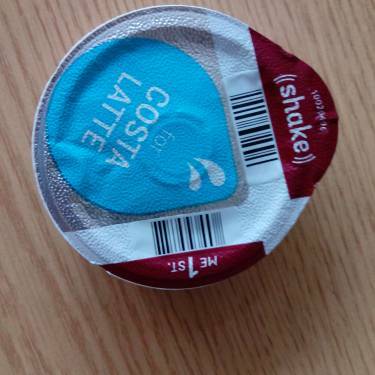 This is thanks to the machine’s patented barcode INTELLIBREW technology, which lends great synergy between the Vivy 2 and inserted coffee pods, which work together like a well-coordinated strike team. Every Tassimo coffee pod has a barcode that the Vivy reads and then adjusts itself to the right temperature and water-to-coffee-ratio needed to deliver the perfect brew. As a result, whatever your choice of drink, the Vivy will leave your taste buds dancing in delight. But, before you get to this part of the Bosch Tassimo Vivy, you need to know how to load the machine. With all angles of the machine smoothly curved into an attractive all-black design, the stunning Vivy has a few cool treats that make the machine quite easy to use. For starters, a clear tank cleverly pulls out from the side for fuss-free filling while the power button sits neatly on the opposite side. In turn, the top section lifts up, allowing you to insert your coffee (and other) pods with ease. The drip tray lifts up as well or detaches entirely to make room for tiny cups, mugs, and tall coffee glasses. Once you have turned the machine on, filled up the water tank, and positioned your T-Disc, brewing coffee is as simple as hitting the multi-purpose control button situated slightly below the machine’s nozzle. 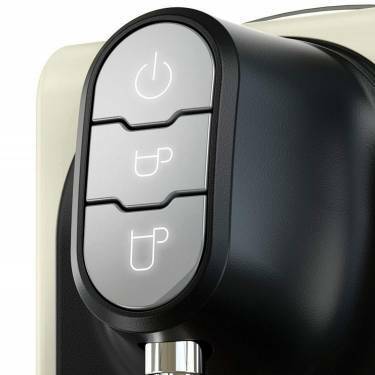 The Bosch Tassimo Vivy also features an LED interface that in addition to showing current information during a brew run, tells you when the tank is running low and when it is time to descale. For this, you insert the machine’s bar-coded cleaning disc into the coffee pod holder and hit the control button. A cup has to be in place to catch the water that flows through during the descaling process. What does the Bosch Tassimo Vivy make? This Bosch Vivy is designed to take the whole array of Tassimo pods, which include herbal, fruit, & regular teas, chai lattes & other speciality coffee brews, and even chocolates. 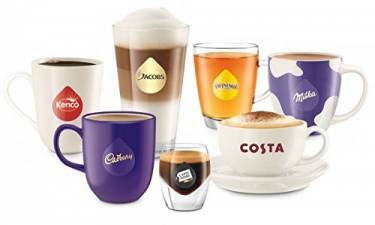 Since Tassimo collaborates with over 40 of the best brands including Jacobs, Milka, Hag, Oreo, and the beloved Cadbury, you are spoilt for choice when it comes to pod flavours. True to what the brand claims, there is literally a whole world of Tassimo pods to discover. How fast is the Bosch Tassimo Vivy? The Vivy uses an innovative flow-through heater that heats up very quickly. This coupled with the fact that water does not have to be heated in between brews allows the Vivy coffee pod maker to deliver your favourite hot drinks in just a few seconds. 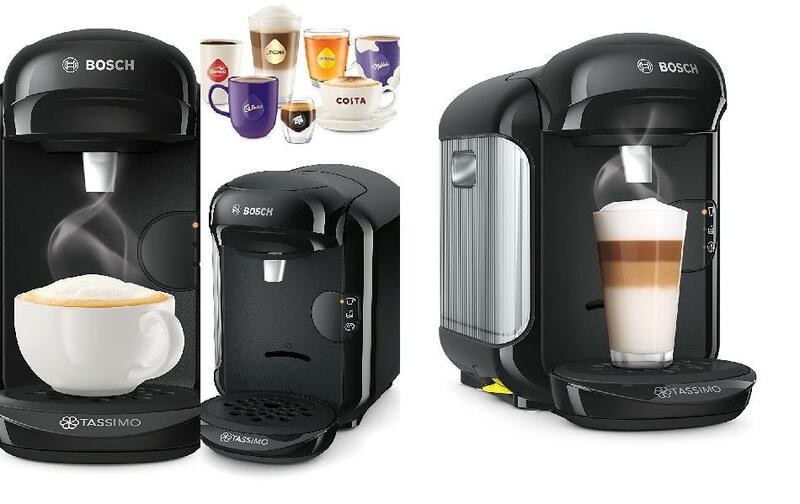 Although the compact space saving design of the Bosch Tassimo Vivy subjects users to constant refills especially when brewing more than a few drinks, the machine more than makes up for this shortcoming with its wide range of flavour pods. Add the very cheap price tag and you have a great appliance that will make a perfect fit in any home where the demand for coffee (and a variety of other drinks) is high but the patience for waiting around for brews is low. The Delonghi EN520.W Nespresso Lattissima Plus is a feature-packed machine that ticks every box in the capsule machine checklist for many coffee lovers. It looks great and features a silky white finish with black accents. What’s more, this appliance is easy to use, produces delicious coffee, and fits easily into tiny spaces with its reasonably sized build of 31cm wide by 25cm high. It will also help save on energy and brew your drinks quickly. Add the included Instant Froth Dispenser system featured in the Lattissima and you have more than you could ask for in a coffee pod machine. In the following buying guide, you can learn more about this feature-rich appliance and determine whether it is the right machine for you. Despite being a multi-functional coffee maker that also froths milk, there is nothing complicated about using the Lattissima Plus. Both the machine’s water and milk tanks are removable and as such, can be filled easily. Covers on the two tanks make it possible to carry the tanks and re-attach them to the Lattissima without spilling. When it comes to brewing your coffee, a lever at the top of the machine makes easy work of adding and disposing capsules while 4 patented single touch buttons (for making Espressos, Long Coffees, Cappuccinos, and Latte Macchiatos) allow you to effortlessly draw your favourite drinks at the simple push of a button. That said, making black coffee and one with milk requires a different process. Making coffee simply entails filling the tank, inserting your capsule, placing your cup, and pressing either the espresso or long coffee buttons. The machine will stop after delivering the pre-set amount, but you can press the same button again to draw more coffee. 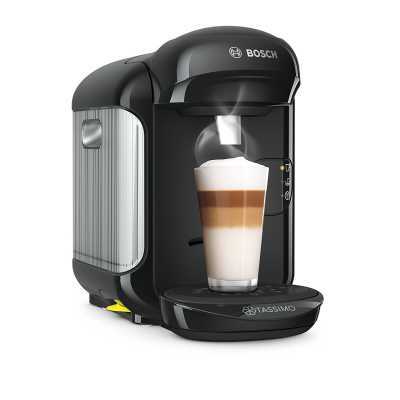 On the other hand, lattes and cappuccinos require you open the steam connector by sliding it to the left, connect the milk jug to the machine, insert your pod, and turn a dial to choose the quantity of froth you want before finally hitting one of the included buttons. What Does the Delonghi Nespresso Lattissima Plus Make? 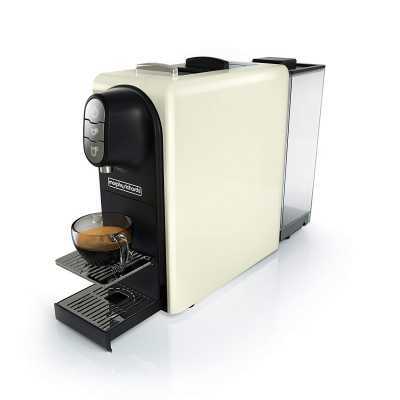 Much like its capsule-sharing counterpart, the Nespresso Inissia, the EN520.W Plus has a powerful 19-bar pump. So, whether you are making a shot of espresso, a latte, or even a Lungo-style coffee, you are guaranteed a full-bodied brew with a smooth texture, rich aroma, and a deliciously generous crema. As for brew options, the pre-set espresso and long coffee settings will be more than enough for coffee lovers, while the cappuccino and latte macchiato settings offer a good start for those who are not particularly fond of entirely black coffee. You can also make a whole lot more than the 4 built-in brews and even choose how dark you want your coffee with Nespresso’s range of capsules. 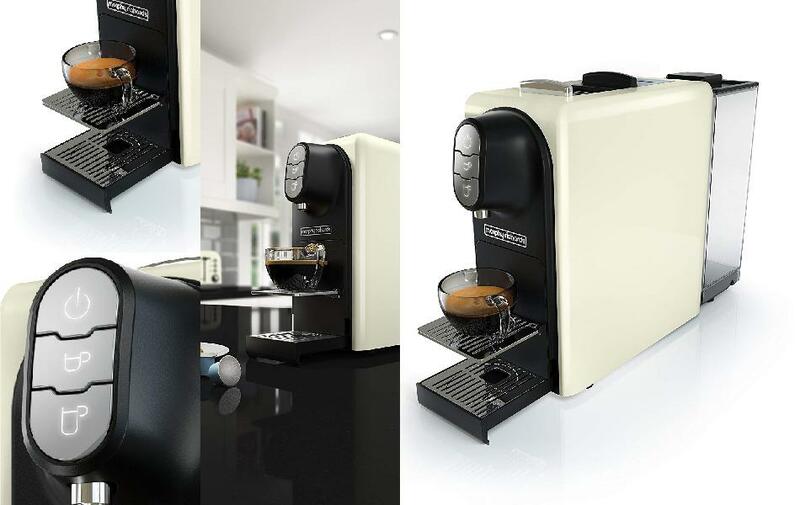 How Fast is the Delonghi Nespresso Lattissima Plus? If speed in one of the attractions that drew you to coffee capsule machines, this Nespresso Lattissima Plus is perfect for you. The machine only takes 40 seconds to heat up and brews just as fast, making it one of the fastest capsule machines available. The Delonghi EN520.W Nespresso Lattissima Plus may not be cheap but it comes with indulgences that make it a worthwhile buy. 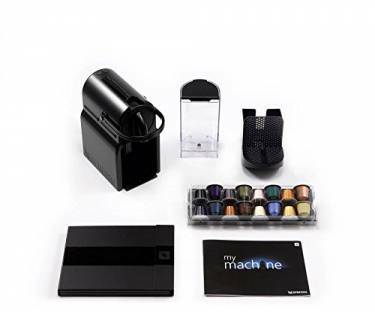 Its milk frothing capability, programmable settings, and integrated tank for collecting used capsules are features that you do not easily come by in coffee pod machines. The first thing about the Morphy Richards 179001 pod coffee maker that stands out is the towering size of the machine. This unit goes beyond the norm when it comes to a capsule machine by offering a large 1.4L tank that ensures you do not have to keep running to the tap to satisfy your coffee needs. And, that is just one of many alluring aspects of the machine. Read on to find out what else is featured in the Morphy Richards 179001 bag of treats. As far as design goes, the Morphy Richards 179001 has a very simple build. The unit consists of a rectangular structure with a removable water tank at the back and control buttons and drip tray at the front. At the top of the unit is a lever-like handle, which you push back to gain access to the capsule compartment. Making up the controls of the Morphy Richards 179001 are 3 simple illustrated buttons. These include a power button, a tiny cup icon for the espresso button (that draws 40ml of coffee), and a long coffee button (represented by a big cup icon), which delivers 110ml of frothy goodness. An integrated drip tray at the base of this Morphy Richards unit provides a resting place for tall coffee glasses and large mugs while smaller vessels have their very own cup stand, which easily folds away when you are making long drinks. What Does the Morphy Richards 179001 Make? This is another area where the Morphy Richards 179001 outshines its competitors. Unlike others like the Nespresso Inissia and Delonghi Nespresso Lattissima Plus, this appliance can take coffee capsules from other brands. It will brew Morphy Richard’s very own U: pods as well as Nespresso capsules. Therefore, you get to enjoy a wider array of drink options. And, that’s not even the best part. U: pods undergo a slow roasting process that draws the ultimate aroma and flavour of coffee beans while Nespresso capsules are expertly brewed to a wide range of flavours and finishes (rich, sweet, light, lemony, distinctive, balanced, among others). This makes great tasting coffee another benefit of the 179001. How fast is the Morphy Richards 179001? When it comes to speed, the Morphy Richards 179001 has a reasonable warm-up time. The warm-up time prepares your coffee maker to brew fast cups of your favourite beverage in record time. You can expect your cup to fill up within seconds of pressing either of the brew buttons once the machine is ready. The Morphy Richards 179001 has a lot of advantages. The water tank is huge, the coffee comes out reasonably hot, brewed beverages (including espressos) taste amazing, the basket for used pods is quite big, and the inclusion of 2 cup sizes gives you plenty of control over how to make your coffees. However, the best upside of this unit is the fact that it comes at the surprisingly affordable price. So, even if you are shopping with a low budget, you can still get to enjoy this machine’s amazing features. 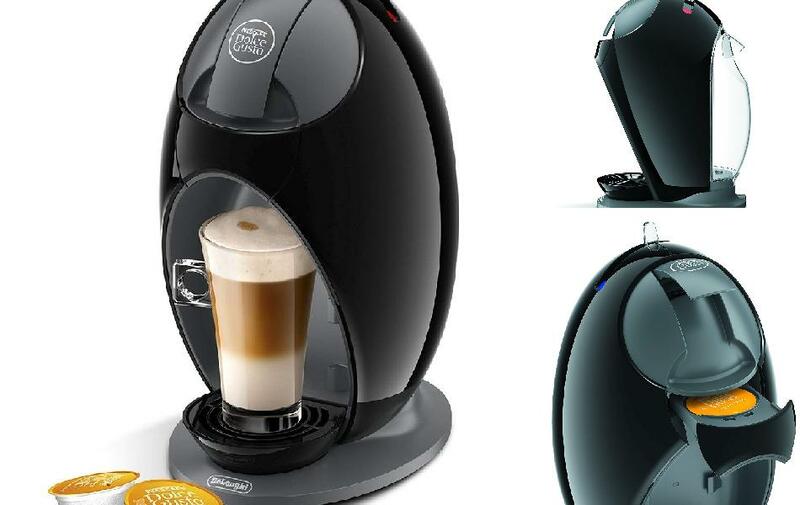 If aesthetics are anything to go by, the Nescafe Dolce Gusto Jovia EDG250B would be the ideal choice for anyone looking to buy a stylish pod coffee maker. Luckily, Nescafe claims the Jovia EDG250B is “delighting in taste as much as in appearance”. 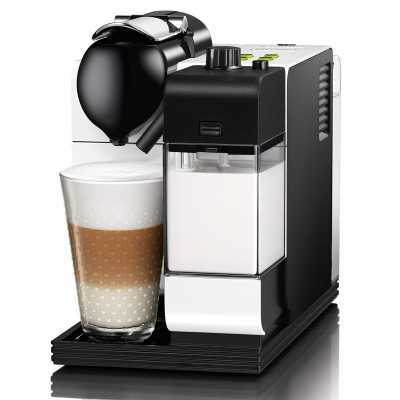 What’s more, the Nescafe Jovia nails it when it comes to ease of use, convenience, and versatility. Read our complete buyers guide to find out what it has to offer. The Jovia features a simple but stylish design. It consists of a base with removable drip tray and the main body. The appliance’s housing sports a black sleek finish with a clear tank at the rear. Along the front, there are three separate footholds. These footholds help to move the drip tray up and down so that just about any cup height can fit under the serving nozzle. Brewing coffee starts with filling the Jovia’s water tank. The tank simply lifts off from the machine for easy filling at the tap. It is advisable that you avoid filling the tank to the brim as this can lead to water spilling as you pop the tank back in place. Once the tank is full and safely in place, the next step is to turn the machine on. The power button blinks red for about 30 or 40 seconds before turning green to indicate the appliance is ready for use. From there, adjust the drip tray if necessary to fit in your cup before proceeding to insert your coffee capsule into the machine’s cartridge holder. For this step, you simply flip a locking mechanism situated at the top of the appliance where there is a ‘Nescafe Dolce Gusto’ print logo. Doing this allows you to pull out the cartridge holder and pop in your capsule. When that is done, push the capsule holder back into place and flip down the locking mechanism. Lastly, comes the fun part. The Jovia has a lever that pulls to the right or left so that hot or cold coffee/drinks can flow out respectively. After pulling the lever, coffee (or whatever you are making) flows into the cup below until you push the lever back to the middle. Therefore, you may draw as much coffee as you want. And, as you can sit back to enjoy your cup of coffee, you have the option of replacing the current capsule with a milk one and then pull the lever again to make special coffee blends like mochas and lattes, amongst others. After your drink is ready, press the power button to turn off the machine. What does the Nescafe Jovia Make? There is a good and bad side to what the Nescafe Dolce Gusto Jovia can make. The bad news is that the machine gets its rather mouthful of a name from the fact that it only accepts Dolce Gusto capsules. As a result, you cannot use a coffee capsule from other brands. 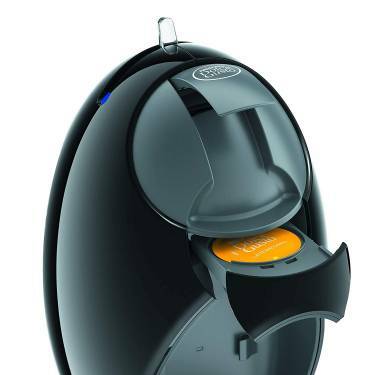 The good news is Dolce Gusto offers a wide assortment of capsules that make over 40 different varieties of drinks. From the classically simple espresso that wakes you up in the morning, to iced cappuccinos & cool teas that cool you down on a hot afternoon, to cafe Americano, Grande, & Lungo coffee blends for ending the day in style, Dolce Gusto offers a capsule for every occasion. The brand even makes hot chocolate capsules. How Fast is the Nescafe Jovia? Like any coffee capsule machine, the Nescafe Jovia delivers drinks (hot or cold) in less than a minute. The wait time is short even if you are making cappuccinos, lattes, or espresso macchiatos where you need to put the respective coffee capsule in first, run the machine, stop to add a milk capsule, and then run the machine again. A convenient and energy-saving auto-turn off kicks in when the machine remains idle for 5 minutes. The tank is rather small. 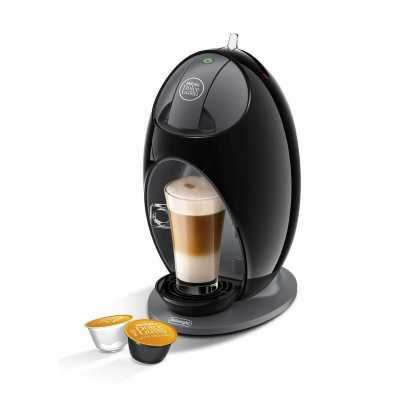 As a capsule coffee maker, the Nescafe Dolce Gusto Jovia EDG250B is hard to fault. It has a stunning design, works fast, and makes an impressive range of drinks. It even serves your beverages hot or cold. The only problem is that its 0.8L tank is quite small and can only make a couple of cups at most before needing a refill. Therefore, if you live in a home full of coffee junkies, you may want something bigger like the Peak Coffee Machine or the Morphy Richards 17900. 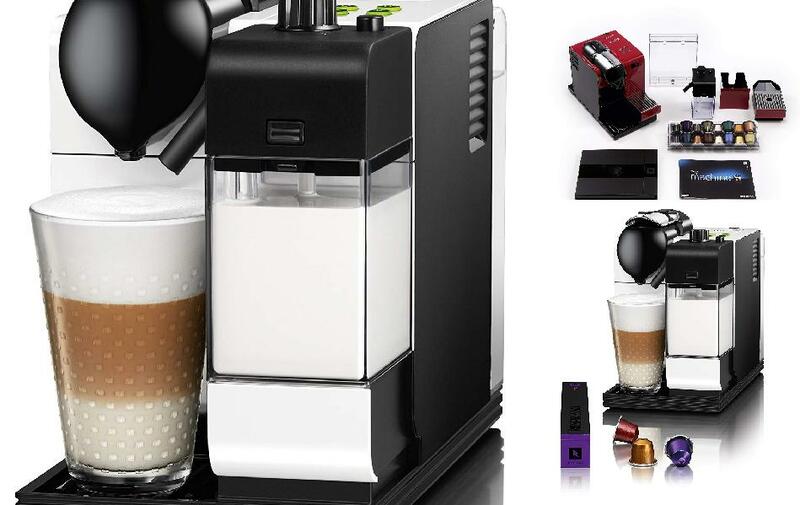 Whether it is the all-plastic construction or the super-slim build that is just slightly wider than an espresso cup that prompted Nespresso to sell this Inissia pod machine at an almost throw-away-price, you will be more than glad they did. Coffee pod machines tend to deliver strong espresso-like doses of coffee. So, if you prefer a less intense cup of coffee, you will be forced to make do with what you get or find an alternative coffee maker. With the Nespresso Inissia, this is not a problem you will face as the machine breaks from the norm with a unique design that brews both intense and mild cups of espresso. 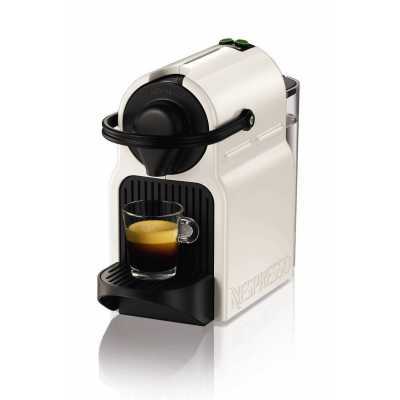 Instead of the usual one-touch button or combo of power and control buttons, the Nespresso Inissia is equipped with 2 brew buttons – one for delivering a single shot of espresso and the other for making Lungo coffee (an Italian-style espresso that is black but with much more water than an average espresso shot). Since there is no power button, making your coffees and milky brews, begins with popping in your capsules. 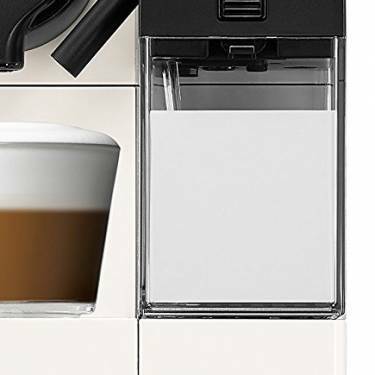 To make this easy, the Nespresso Inissia has included a handle in the machine’s design which when lifted exposes the capsule chamber where you can simply drop in your capsule. After that, you only need to lower the handle and press either of the buttons to bring the machine to life. Both buttons deliver a pre-set amount of coffee, but you can draw more or less by keeping your finger on the respective button of what you are making, and letting go when you’ve got enough. The best part is that the Inissia will register the amount you have drawn and deliver the same the next time you brew. So, if you have a favourite mug, you can programme it into the machine’s memory. Another highlight of the Nespresso Inissia is that it features a chamber for holding used pods. The chamber is built into the machine and catches a used capsule whenever you lift the machine’s handle to drop in a new one. This is unlike most pod machines where making special coffees requires you to stop the machine to remove a used capsule and replace it with a milk-flavoured one. What Does the Nespresso Inissia Make? The first thing to love about the Nespresso Inissia is that it makes the same rich, bold, and silky smooth espressos that you find in coffee shops but devoid of bitterness. This is courtesy of the Inissia’s 19-Bar pump, which applies high pressure to draw a rich aroma and taste while preventing the coffee from becoming bitter. To top it off, the high pressure of the machine also generates a full crema that makes for a wholesomely satisfying drinking experience. The only downside is that you will have to contend with Nesspresso’s capsule menu which is fewer (a little over 20) than what other brands offer. However, you can take comfort in knowing that Nespresso capsules comes in both light and dark roasts as well as different flavour options. The brand also makes seasonal and special roasts. How Fast is the Nespresso Inissia? The Inissia is one of the fastest coffee pod machines in the market. Unlike other models where you have to wait around for the machine to heat up prior to brewing, the Inissia only needs 25 seconds to reach ideal temperatures. As a result, your beverages will be delivered delightfully hot almost instantantly after pressing the machine’s brew button. The power save mode kicks in after 9 minutes of inactivity and automatically shuts off the machine. However, if you plan to make one or more cups, you can adjust power save mode to activate after 30 minutes of inactivity. 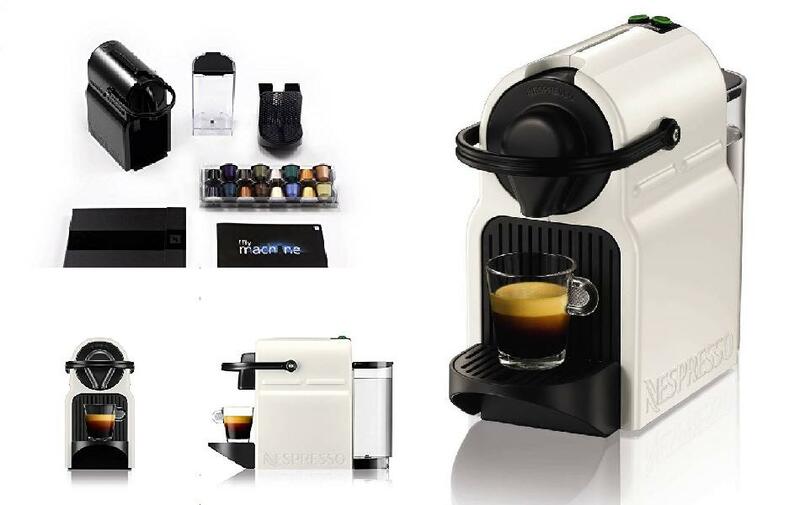 Whether you are shopping for a coffee pod machine on a low budget or have a rich palate when it comes to coffee, the Nespresso Inissia should do just fine. The versatility of this machine makes it a good fit for just about anybody. Ideal for both home and office use, this coffee capsule maker will make sure everyone gets their coffees fast and easily. Lavazza is one of the top brands that manufacture espresso machines that not only ooze Italian style but also deliver great results, and their Jolie Red 18000072 coffee pod machine is no exception. This classic no-frills espresso maker is perfect for those who like their coffee strong or mild but don’t have room for a large appliance. In addition to being compact, the Lavazza Jolie Red 18000072 coffee pod comes in a selection of colourful options that will be sure to spice up your kitchen decor. The best part is that it brews great tasting espresso at the push of a button. Find out whether this is your ideal capsule coffee machine by reading our complete buyer’s guide below. Simplicity is what makes the Jolie Red a joy to use. The wide-brimmed tank at the back comes right off for easy filling over the tap. It has fill marks labelled on the side that make it easy to know the proper amount of water you need to add. Once the machine is plugged in and ready to go, all you have to do is lift the pod-loading lever, throw in a capsule into the recess on top of the unit, lower the lever back down and push the supply button. In about 90-seconds, your aromatic shot of espresso will automatically dispense into the cup placed below the serving spout. 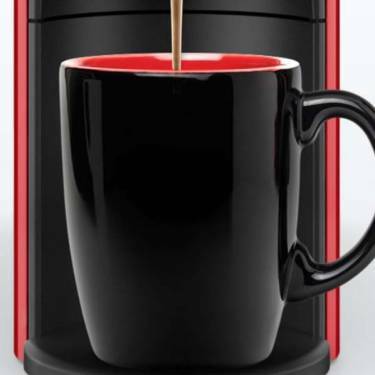 A single power-on/supply/dispense button is the only control that users interact with when using the Lavazza Jolie red. The button lights up in various ways to allow for easy operation. For instance, it shines with a white steady light when the machine is ready for use. The button may also blink shortly after power switching on power during the heating cycle or to indicate that the used capsule holder is full and needs emptying. To keep your worktop splatter-free, the raised platform under the dispensing unit brings your coffee cup close to the pouring spout and acts as a drip tray as well. Tall mugs can easily fit under this coffee pod maker if you remove the drip tray. When it comes to cleaning, the Lavazza Jolie Red simplifies matters since all the removable parts can go into the dishwasher. These include the water tank, drip tray, and spent-capsule holder with drainer. The only manual maintenance required is descaling of the coffee capsule maker every 3-4 months to keep the dispensing nozzle from clogging. This is a straightforward process and it is well documented in the easy-to-follow multilingual manual that comes with the capsule coffee machine. What Does the Lavazza Jolie Red 18000072 Coffee Pod Make? If you are a die-hard espresso enthusiast or simply love mild Italian style Lungo, then this coffee capsule machine would make a great addition to your kitchen. Lavazza throws in a selection of 9 different capsules to help you get started. The A Modo Mio capsules that come in the starter package offer the best of Lavazza flavours. Whether you have a penchant for coffee that is intense, smooth, chocolatey, or fruity flavoured, Lavazza capsules offer something for every palette. The Lungo pods contain just the right amount of coffee for making long espresso. This makes the Lavazza Jolie capsule coffee maker easier to use compared to the Nespresso Inissia that features an extra button for varying the amount of dispensed water when making a cup of Lungo. 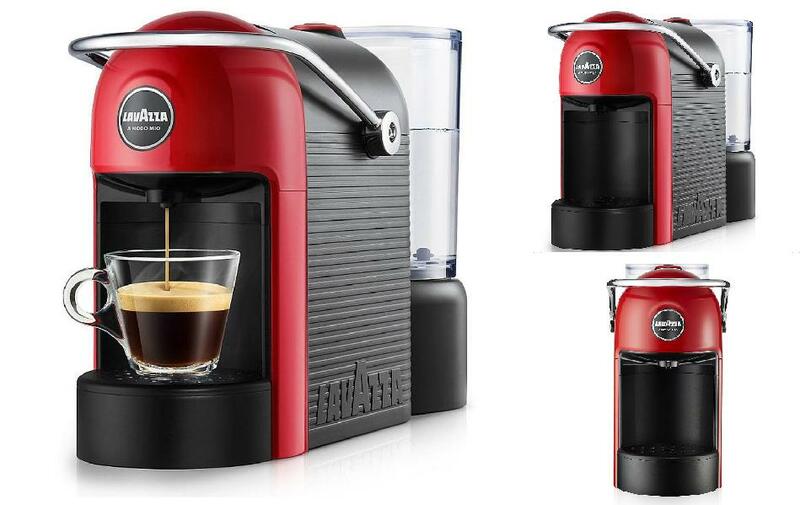 How Fast is the Lavazza Jolie Red 18000072 Coffee Pod Machine? In as little as 15 seconds, the thermoblock on this coffee pod machine heats up, allowing it to reach brewing temperature within no time. The best part is that there is very little noise produce as the machine heats water. Rated at only 44-decibels, this Lavazza unit operates silently so that you can make your espresso while having conversations, watching TV, listening to music or reading. 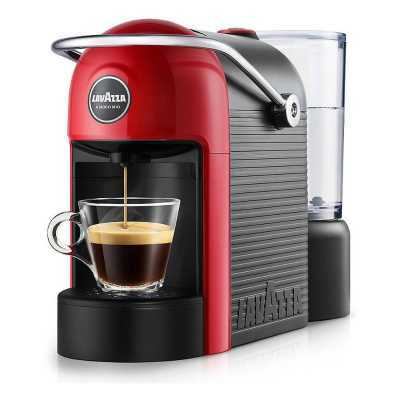 Designed for small kitchens, the Lavazza Jolie Red 18000072 is a nice compact coffee pod machine with a lot to offer. It is stylish, easy to use, operates quietly, and makes excellent crema-topped espresso. All this comes at a very affordable price, which makes the Lavazza Jolie Red 18000072 coffee pod machine a great choice if you are on a tight budget. A coffee pod machine offers the quickest and easiest route to a delicious cup of homemade espresso (or any coffee for that matter). Simply pop a pre-packaged coffee pod into the machine, press a button, and you will have your coffee in just a few seconds. But, are pod machines all sunshine and rainbows? 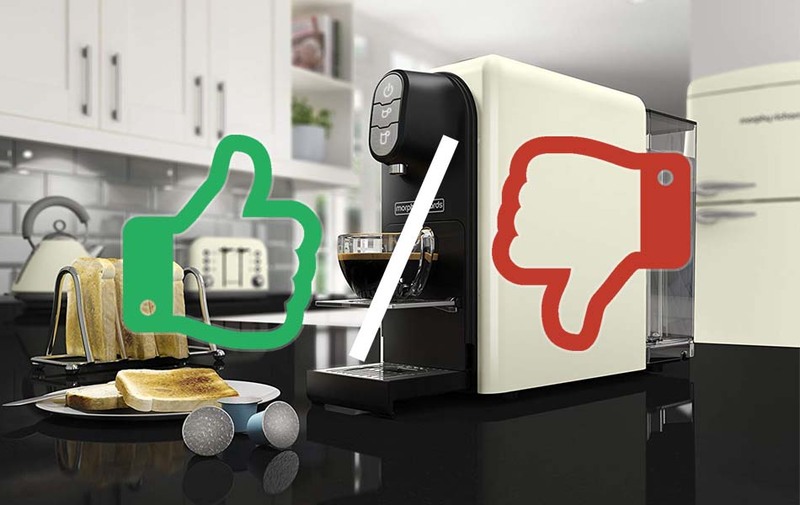 This part of our guide delves into the pros and cons of coffee pod machines so you can decide if the advantages out-weigh the downsides for you. The best and obvious upsides to coffee pods are that they offer a fast, fuss-free way to make great coffee. Coffee pod machines take less than a minute (around 30 to 40 seconds) to give you a perfect shot of espresso. And, you do not have to grind beans or worry about getting the coffee measure, water quantity, and temperature right, as the machine does it all for you. For a coffee fanatic, these are more than good enough reasons to invest in a coffee pod machine. But there’s more. Coffee pods are probably the cheapest of coffee makers. You can find a decent model at around £50. Of course, there are pricier models (over £100) that offer smart features or more flexibility in what you can make. However, the bottom line is that coffee pod machines are cheaper to buy than both ground coffee and bean-to-cup machines. The great thing about coffee pods is that you get the same great taste every time. These machines have a zero margin for error since they come with built-in programmes that are set to heat to specific temperatures and draw a certain amount of coffee and water. As a result, the outcome is always the same with every cup. When it comes to coffee makers, pod machines are among the easiest to use. You only need to fill a water tank, insert the pre-packaged ground coffee into the respective pod holder, press a button or two, and a hot cup of coffee will be delivered even before you finish yawning. And things only get better when it comes to maintenance. With most machines, regular descaling and a quick wash of removable parts after each use is all the maintenance that is needed. While coffee pod machines are designed to be single-serve appliances, some can perform more than one task. For instance, you can find a model that delivers an array of brews ranging from a simple espresso to special blends such as decaf coffee, mochas, chai latte’s, and so on. Alternatively, some machines make a single cup of coffee as well as fill up a carafe. Unfortunately, coffee pod machines also come with their fair share of downsides. Whether or not these downsides are deal breakers will depend entirely on how passionate you are about coffee. That said, the following is a breakdown of these disadvantages. This is the biggest drawback of coffee pod machines. So, you have to be careful when buying your pod machine. Make sure the model you buy gives you the freedom of using coffee pods from different brands or that you’re satisfied with the selection of drinks offered. Although pod machines are cheap to buy and maintain, they tend to be costlier to run compared to other coffee makers. The reason for this is because you will need a coffee pod for every cup you make, and pods aren’t cheap. Compared to ground sachets that go for around 7p, coffee pods will cost you anywhere from 23p to 60p a piece. At this rate, the cost can easily begin to add up with heavy use. The consistency of coffee pod machines can become an annoyance if you like to experiment with coffee recipes or have created your secret recipe that demands precise measurements of ingredients. Even if you find a machine that can take differently flavoured pods, or allows you to adjust water levels or temperature, the extraction method remains the same (i.e. equal pressure and the same amount of coffee), leaving you with very little say as to how your brews come out. The fact that coffee pods remain sealed all the way from the factory to your cup gives them a freshness advantage that translates to blends that are very rich in taste and flavour. Some pods even contain milk powder for making the frothy part of specialized drinks like cappuccinos. Despite this, avid lovers of coffee will argue that although pod machines deliver great tasting brews, the results are not the same as what you will get from machines that grind beans immediately before brewing. Now, that you know the pros and cons of coffee pod machines, the big question you are probably thinking about is, “are these appliances worth it?” Well, with coffee pod machines, you either love or hate them depending on whether you would like your coffee fast, tasty, and mess-free, or if you are very particular about how you like to prepare your caffeine fix. However, there is no denying that the speed, convenience, ease of use, and affordable buying price of the coffee pod machine put it a class above most coffee makers in the market. Although the coffee craze has been with us for quite a while (dating all the way back to the 9th century in Ethiopia), there seems to always be a new brew or machine that promises to revolutionize the experience of drinking this age-old beverage. For example, the demand for coffee on the go has inspired some interesting inventions. With most of us being unable to start the day without a cup of coffee, single serve coffee makers are becoming a common fixture on our kitchen worktops. The convenience of being able to get your caffeine fix without having to wait around is simply too good to pass up. Increasing demand for instant coffee has also put emphasis on packaging, which in turn has led to the innovative coffee pods and capsules. Whereas single serve coffee makers deliver an instant cup, coffee pods and capsules eliminate the need to grind beans or measure out ground coffee, making for a wholesome quick, no fuss, and zero mess experience. So, what are coffee pods and capsules? And, why is it important to know the difference between the two? Read on to find out. What are Coffee Pods and Capsules? To understand the differences between pods and capsules, you need to know what these coffee brewing ingredients are in the first place. The coffee version of tea bags, pods and capsules are containers that hold a single serving of ground coffee. A pod is a 2-sided, disk-shaped porous paper with ground coffee compressed inside it. Think teabag only puffy and round in shape. The standard ESE (Easy Serving Espresso) paper pod contains 7 grams of ground coffee. However, you can find ‘double coffee pods’ (with 14 grams of coffee) for making a double shot of espresso. On the other hand, coffee capsules are quite different. They are cylindrical vacuum-packed containers that feature a body made of aluminium or plastic and a foil top. 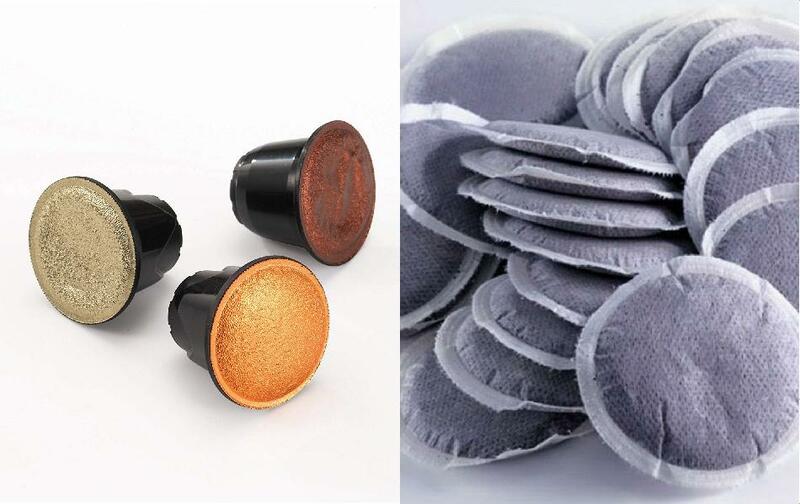 Coffee capsules come in different sizes (containing 5-7 grams of coffee) and can only brew coffee in an appliance that is compatible with capsules. Some machines allow for a broad range of capsules while others only accommodate coffee capsules from a specific brand. This is something you should look at when shopping for a capsule coffee machine. So, why is it important to know the difference between these two pre-packaged versions of coffee? Well, although the difference between pods and capsules is subtle, it has far-reaching consequences. Pods require brewing in a slow-pressure almost drip system and as such, make it easy to control the strength of your coffee. Capsules, in turn, require an appliance that can push water through the container at high pressure. This coupled with the airtight seal of capsules, which keep the ground coffee fresh by preventing exposure to light, moisture, heat, and oxygen lends capsules the ability to deliver strong (espresso-like) cups of coffee. Therefore, how you like your instant caffeine fix will help to determine the choice between coffee pods and capsules. In our opinion coffee pod machines are something of a mixed bag. They offer unparalleled convenience when it comes to making coffee and many allow you to make virtually any hot drink under the sun – from lattes and cappuccinos to luxurious hot chocolates and teas. But, they do come with some drawbacks the biggest being their ‘one size fits all’ approach. So, what do we recommend? If, like many people, you’re busy and often find yourself pressed for time, you can’t beat a coffee pod machine. In fact, we have a permanent one in-situ at our office for that very reason. It’s fast, simple and can make drinks to suit any taste incredibly quickly. However, if you have a bit more time on your hands you might want to look at a bean 2 cup machine for a truly authentic coffee making experience. If you’d like to recap we recommend looking a our comparison table so you can quickly compare all of the features each machine we’ve selected has to offer. There is a good spread between functionality and price and there is a machine to suit virtually every budget.